Bournemouth's Castlepoint Shopping Park has formally re-opened a traditional Bridle Way which follows the eastern boundary the 41 acre complex between Yeoman's Way and Woodbury Avenue. 32 tonnes of special surfacing was laid in 4 days by a local contractor to make what has been used as a footpath over the last 10 years, safer and more comfortable to riders and their mounts. 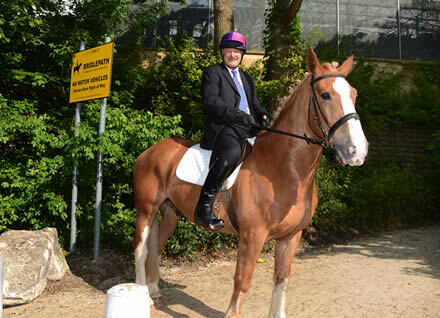 Peter Matthews, General Manager at Castlepoint, was the first to inspect the new signage and surface by riding his own horse Jim, who was transported from his stable at Stock Farm Equestrian Centre at West Parley for the test ride. "People are surprised that the Bridle Way has been frequently used by riders since the construction of Castlepoint," said Peter Matthews. "We felt that as we are trying to encourage people to consider using greener transport to come shopping, why not make it more equestrian friendly!" 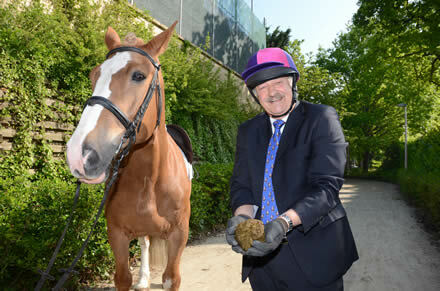 << Peter Matthews with Jim and manure which will be used on the landscaping. He said that daily patrols and security camera monitoring would look out any manure deposited on the route and picked up for the use in the landscaping. "Moral - don't give up when your area becomes urban!" GREAT NEWS FOR PETER MATHEWS AND OTHER EQUESTRIANS. NOT MUCH INFORMATION ON THE ANCIENT RIGHTS OF PASSAGE THOUGH ON THAT ROUTE, WAS OR HAS THERE ALWAYS BEEN A RIGHT OF WAY FOR THE PUBLIC AS A FOOTPATH AND BRIDLE WAY? THE MAXIM BEING ONCE A HIGHWAY ALWAYS A HIGHWAY (RAMBLERS) AND THEREFORE WAS BLOCKED OFF ILLEGALLY, EVEN IF THE SUPER MARKET OWNED THE LAND IT DOES NOT GIVE RIGHTS OF BLOCKING OFF WITHOUT MINISTERIAL CONSENT. THE DEVELOPMENT OF THE HIGHWAY USING IMPORTED MATERIALS LEAVES THE DEVELOPERS LIBALE FOR PUBLIC INSURANCE COVER FOR HORSE AND RIDER ALSO FOR FOOTPATH USERS, ONE SHOULD LOOK AT THE LAWFULNESS OF THE MADE UP ROUTE; IS THIS NOW AN ADOPTED RIGHT OF WAY? WAS IT PASSED BY THE COUNCIL HIGHWAYS AS A' "QUEENS HIGHWAY"? HAS THIS NOW BEEN ENTERED ON THE DEFINITIVE PLAN OR MAP, OR WAS IT ALWAYS ON THE PLAN OR MAP AND THE CLOSURE/BLOCKING OFF LAND GRABING? BEWARE OF COUNCILS AND CONGLOMERATES BEARING GIFTS.